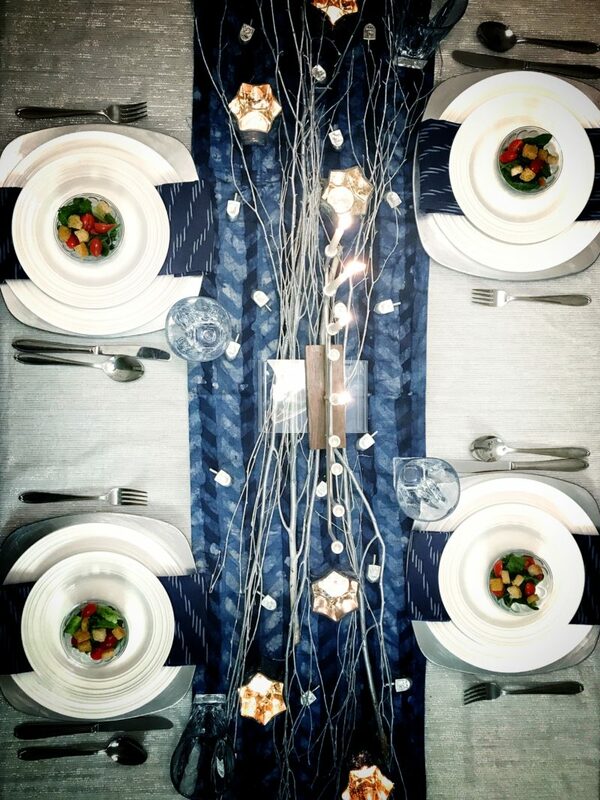 It’s the perfect time of year- time to create a beautiful Chanukah tablescape. Because we can work on all eight days, there is more time to present an intricate, inspiring table. 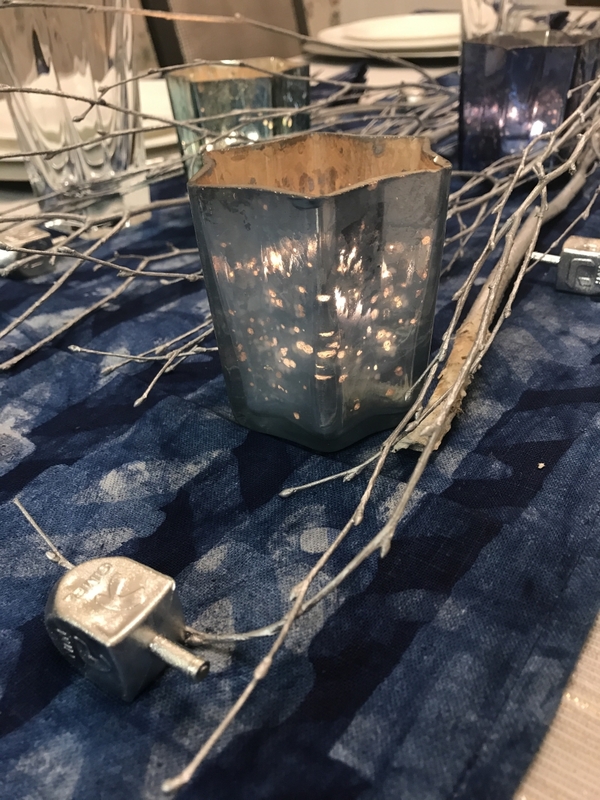 I am thrilled to have partnered with Peace Love Light to bring you this exquisite Chanukah tablescape. Disclaimer: This post contains affiliate links. 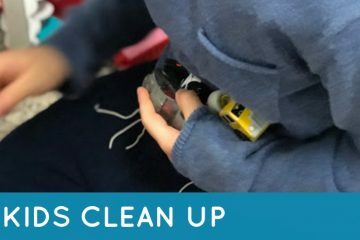 When Peace Love Light approached us with their new product line, I immediately knew I wanted to do something a little different than what I’ve seen in so many magazines. I often see incredible tablescapes presented, but most seem to be intended for large parties or buffet style. 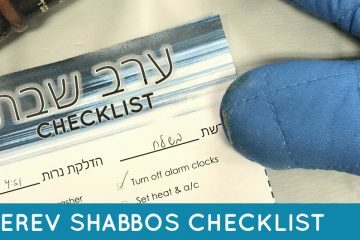 However, Chanukah is also a great time of year to have more intimate family dinners. I love sitting down with my family after we light the menorahs, and having a delicious, cozy meal together. It’s different than a weeknight dinner, but at the same time, it’s not the big party that requires a lot more forethought. The beauty in creating a tablescape for only family is that there’s less effort involved. 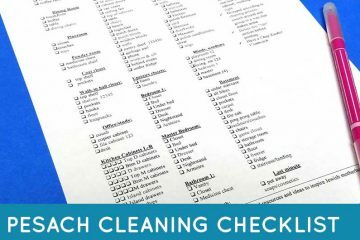 You can easily scale the table settings and decor for any size family. I absolutely love the line from Peace, Love, Light. 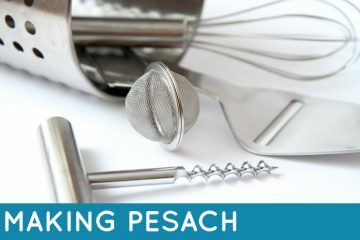 They have beautiful products, for both home decor, table settings and more, for Chanukah and all year round. 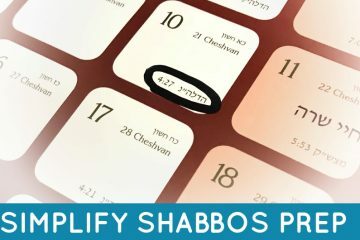 After Chanukah, they will be introducing new designs to their year-round line. I was pleasantly surprised at the high quality and durability of the items they sent me. 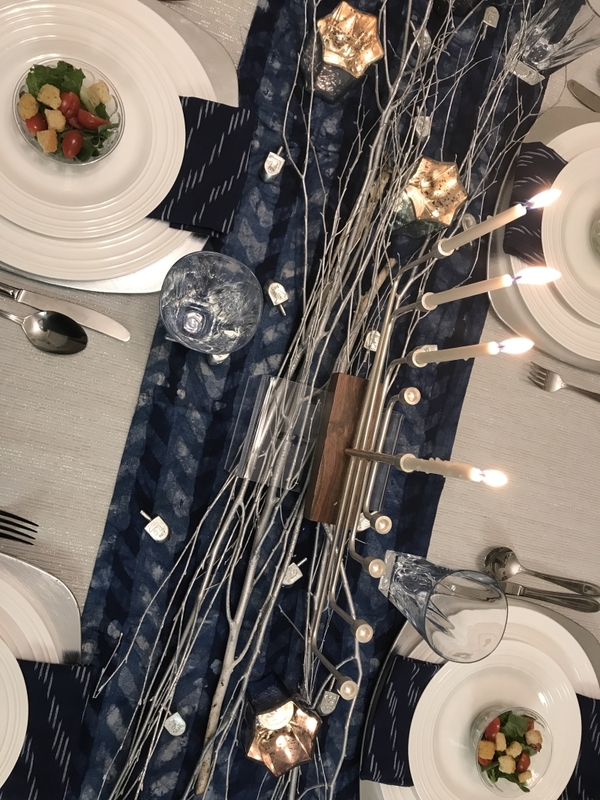 I’ve broken down the steps I took to create this Chanukah tablescape, so that you can recreate it for your own family dinner! 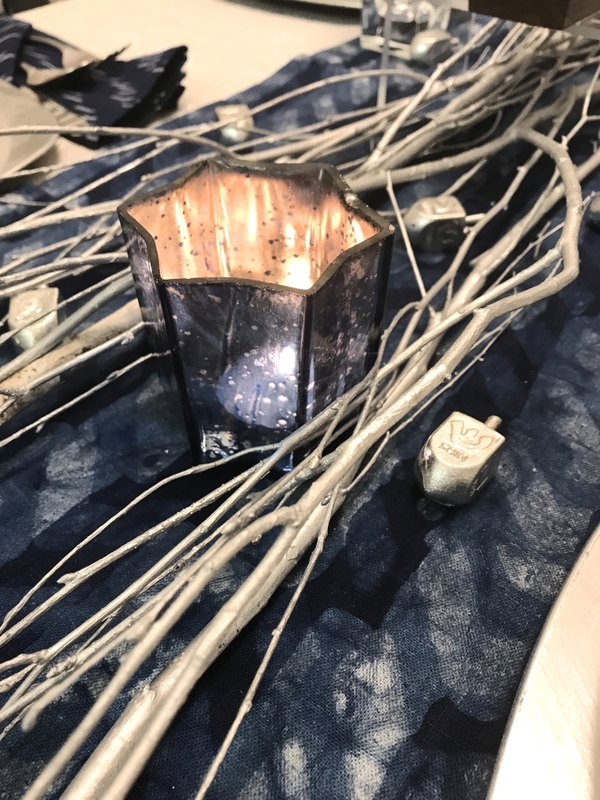 Keeping in line with typical Chanukah schemes, I chose to highlight various shades of blue and silver on my tablescape. The center of my Chanukah tablescape starts with the lovely runner. 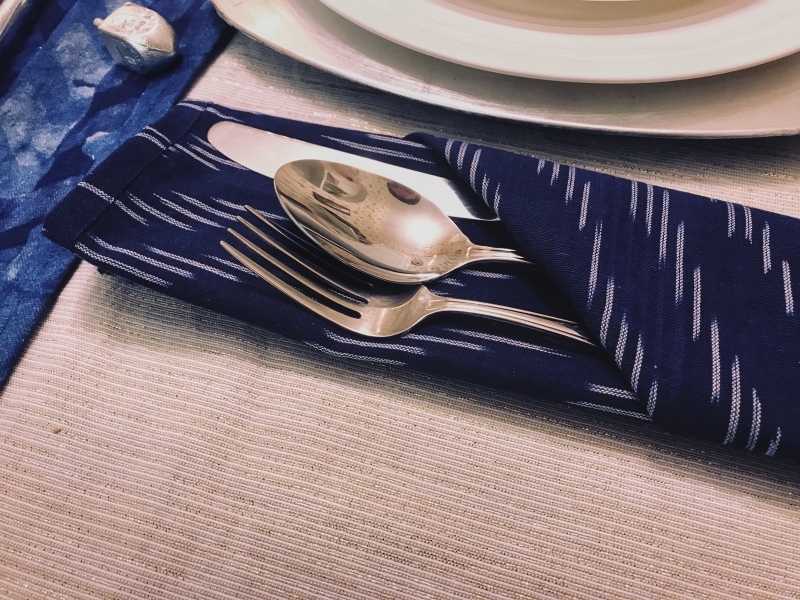 The thick, “Brilliant Blues” table runner set down the length of the table stood out strong with the deep hues and modern chevron pattern. I chose to use a fairly neutral tablecloth from my personal collection, with a faint metallic shimmer. The decor I added to the tabletop showed up perfectly against it. I placed silver branches along the length of the runner. I picked them up at my local florist, and they added a stunning depth and elegance to the the table. The star candle holders were one of my favorites- when I added simple tea lights, they sparkled and shined, throwing a beautiful light across the whole room. They looked gorgeous and festive nestled among the branches, and provided the intimate feel I was looking for. The “Bunch and then Some” decorative dreidels in silver were a perfect complement to the rest of my tablescape. 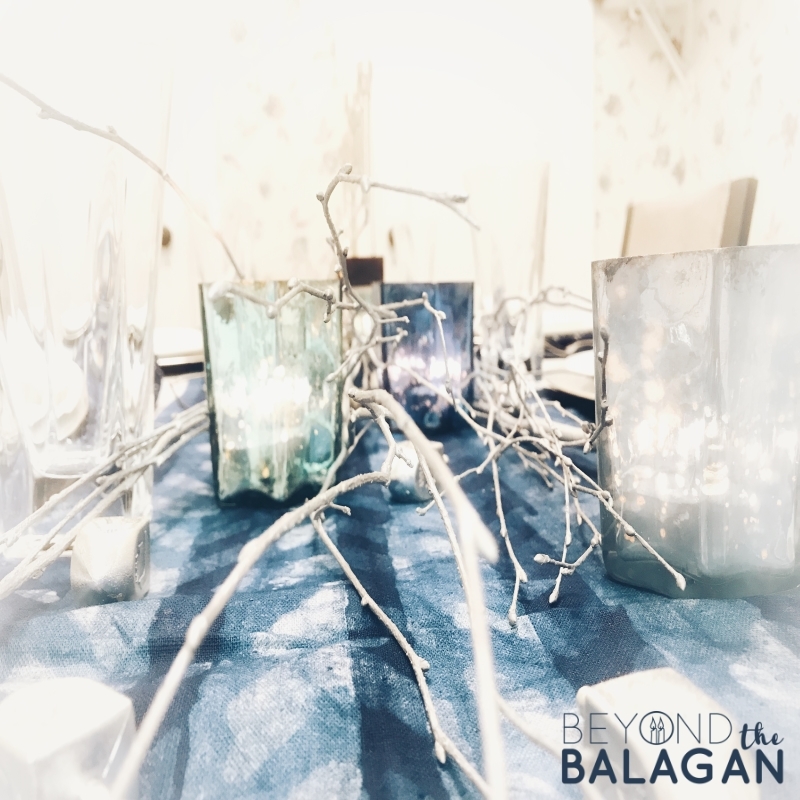 Aside from fitting right in with the color scheme, they added a whimsical aspect to my Chanukah tablescape, and fun for both kids and adults at dinner. 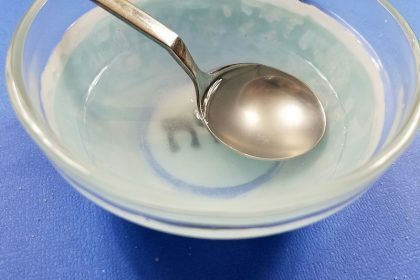 The silver color was high quality and withstood spills and spins, something I was definitely pleased with. In the middle of the runner, I placed the perfect centerpiece- a menorah, of course! This menorah was exquisite and so my type! It has a beautiful, modern aesthetic, and a heavy duty quality feel. 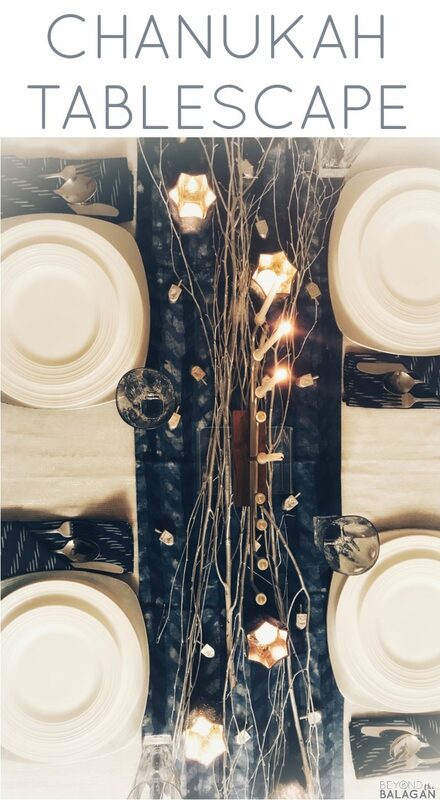 The wooden base paired with low, structured branches was the perfect size for a small dinner. 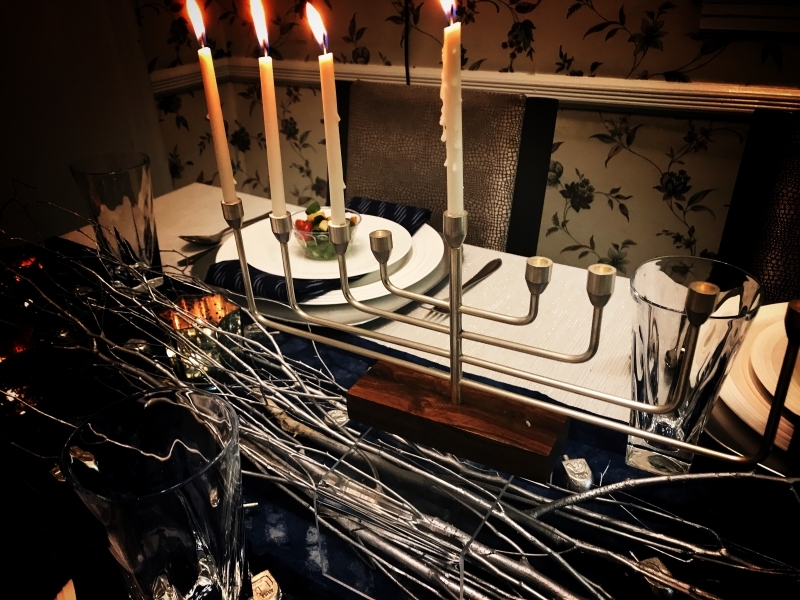 To give it some height, I placed it on top of a small acrylic riser; the riser was barely noticeable, and helped keep the menorah above the branches and other decor. I used this menorah for my centerpiece, but on all other nights it was the perfect piece to join the other menorahs on the windowsill. 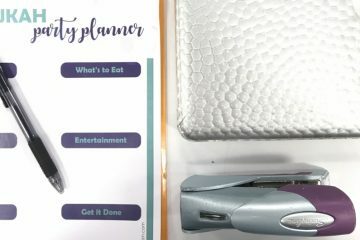 I wanted to keep the table settings simple. 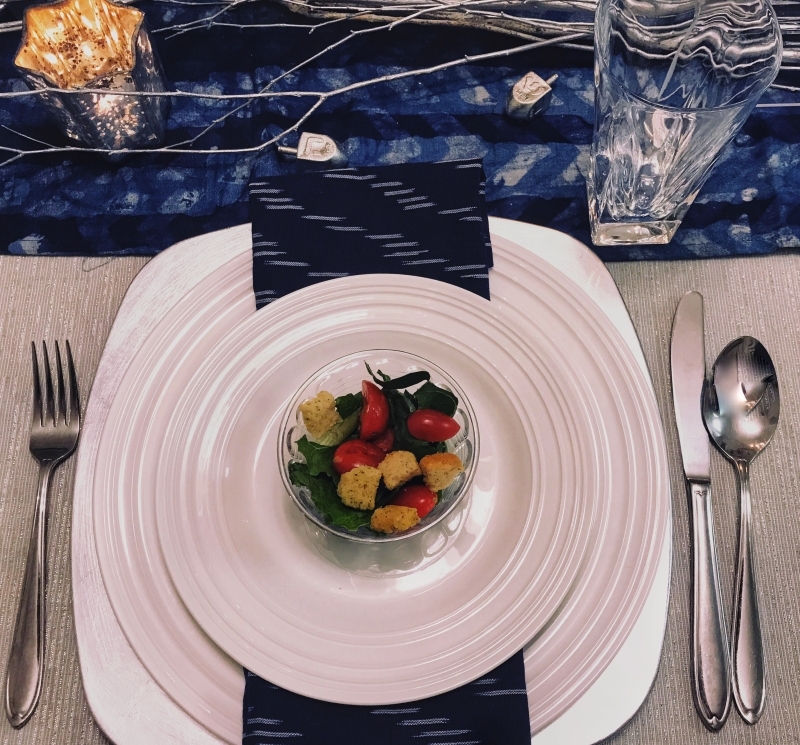 I started with elegant silver chargers, and placed simple, yet chic white dishes on top of them. In order not to detract from the focal point and elegance of the tablescape, I opted for a clean look with plain cutlery and glasses. 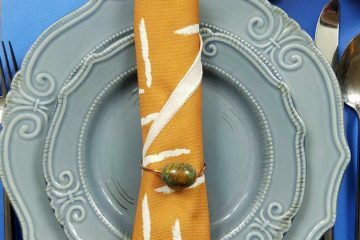 The “Navy, Baby” napkins by each setting picked up just the right shades of blue from the table runner and also complemented the neutral dishes and tablecloth. The napkins are just the right size and weight for folding in different ways. 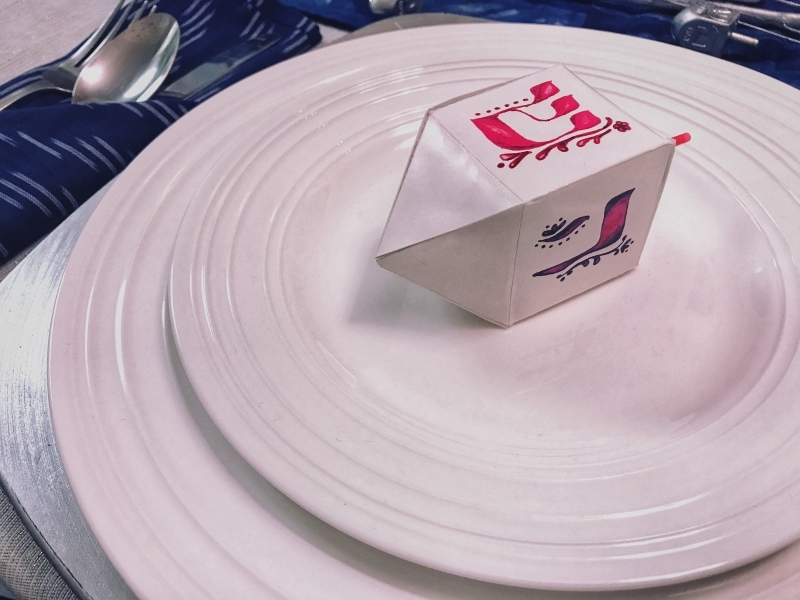 I experimented with creating a silverware pouch, and this dreidel fold, and they both held up perfectly. The products displayed on my Chanukah tablescape are all high quality and have a beautiful, modern feel. 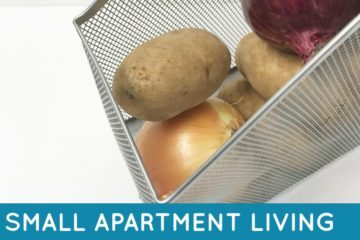 They are versatile enough in their colors to pair with items you already have at home, and easy enough to display in your home all year round. 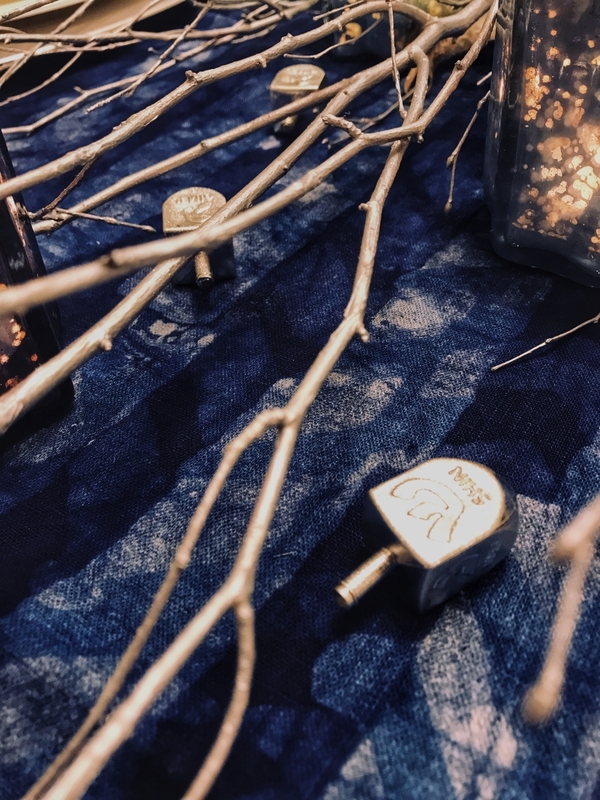 If you’d like to personalize your family dinner even more, consider adding Menucha’s dreidel boxes as place cards, filled with some chanukah gelt for each family member. 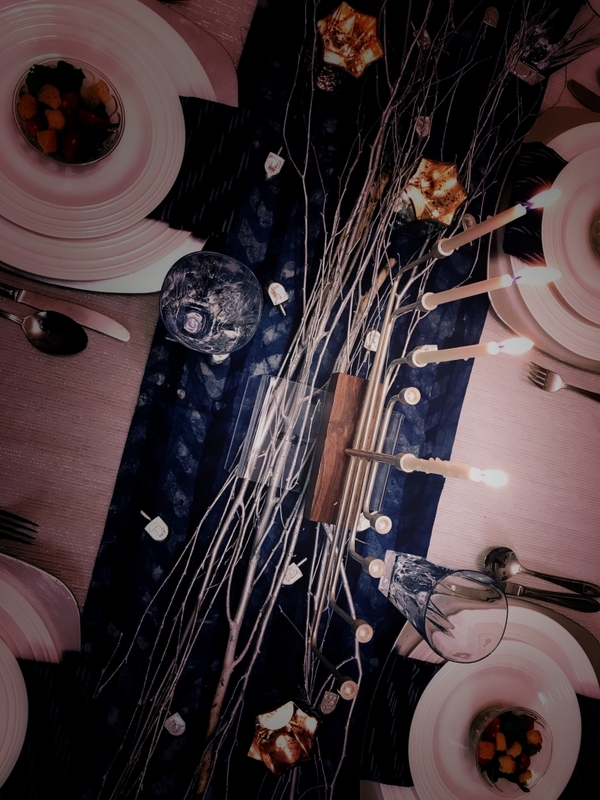 How will you be decorating your Chanukah tablescape? Tag us in your Instagram pictures @beyondthebalagan or comment below!